Pizza. The best food on the planet. 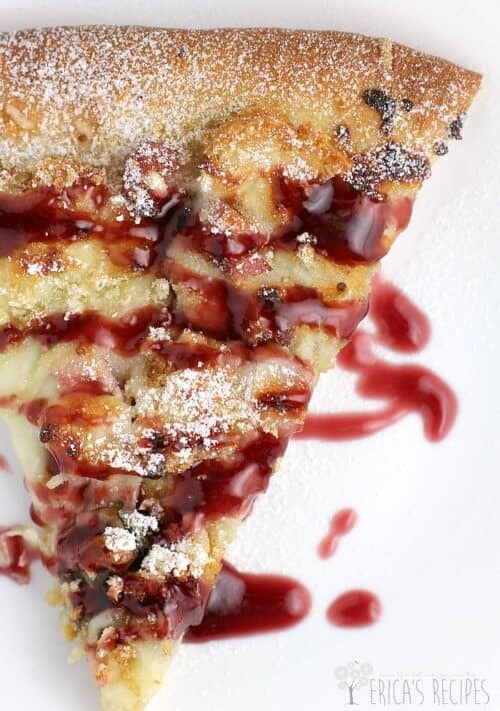 Anything can work on pizza, even powdered sugar and a lovely sweet raspberry sauce. This recipe here is a pizza-fied version of the classic Monte Cristo sandwich. And it is impressive and pretty and creative and damn delicious. 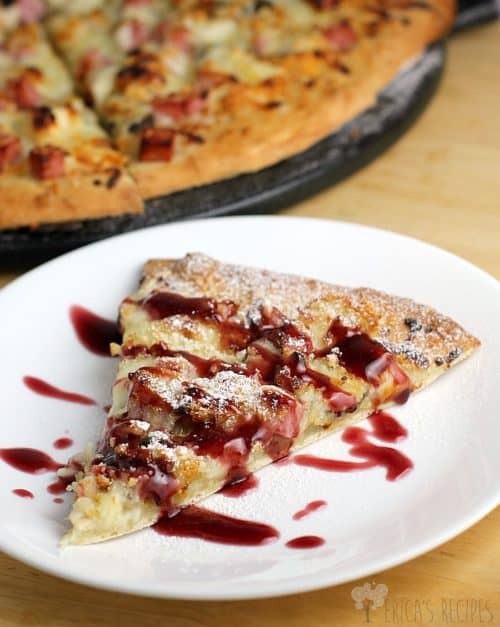 So, ladies and gentlemen, proof that pizza can rock any prom dress …I give you the Monte Cristo Pizza. So, during my late teens, I worked summers at a jewelry store in Boston called Shreve, Crump, and Low. My grandfather was president, my mother was an accountant, and they wanted to be able to ride the HOV lane. So they took me on for the summers for a few years. Shreve’s was located right downtown, across the street from the beautiful Public Garden. And a block or two away was a Bennigan’s. My mom and I ate there at least once a week, always ordering their very large, very fried, Monte Cristo sandwich. Dusted with powdered sugar and served with raspberry jam. This recipe is a recreation of a favorite childhood memory, as a pizza. A traditional Monte Cristo sandwich is kinda basically a ham, turkey, and cheese sandwich, dipped in egg, and cooked like French toast. But the sandwich at Bennigan’s is battered and deep-fried. Epic crunch. Clearly, I was not about to batter and deep fry a pizza. But I could create crunch. So, I used fried chicken tenders (picked them up in the deli section of my grocery store), and I topped the pizza with crispy panko for added crunch. We got texture baby. And then there’s the flavor. This pizza has every element of that old childhood favorite of mine. Salty-sweet. Cheesy. Bit of crunch. Literally fantastic. I have made a lot of pizzas for this site, but some stand out more than others. Like the French Onion. The Cuban. And now the Monte Cristo. A pizza-fied version of the classic Monte Cristo sandwich. Heat the oven to 450F with the pizza stone in the oven to heat as well. Heat an additional 10-15 minutes to ensure the stone is thoroughly heated. In a small bowl, combine the panko breadcrumbs and the 1/2 tsp olive oil. Roll out the pizza dough. Transfer onto the preheated pizza stone. Brush with remaining olive oil. 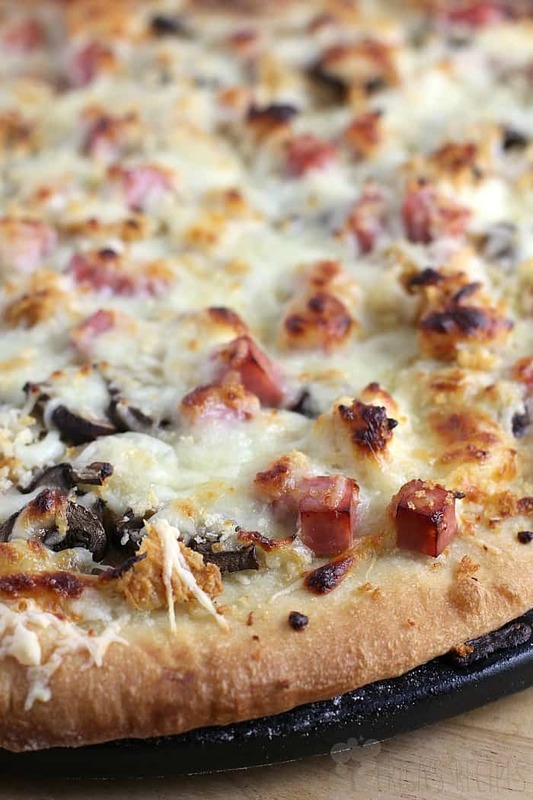 Layer the toppings: mushrooms, ham, chicken, and both cheese. Bake at 450F for 10-15 minutes until crust is golden. While pizza is cooking, prepare the raspberry sauce. In a small saucepan, heat the preserves to melt, adding a little water to thin it out. 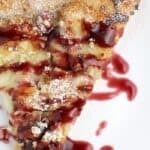 Serve the pizza dusted with powdered sugar and drizzled with raspberry sauce. 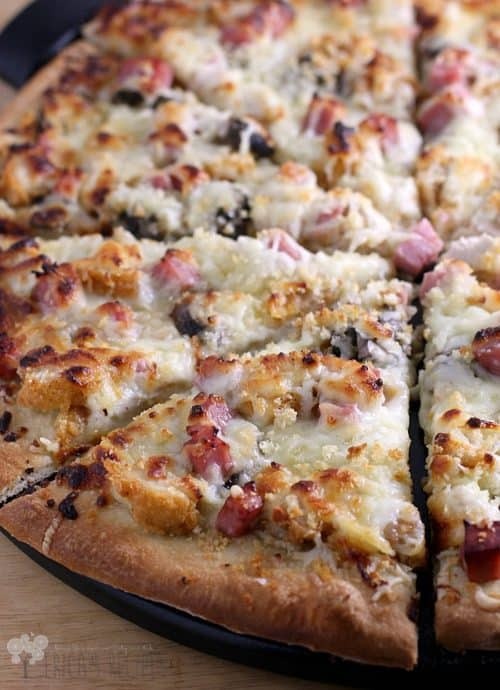 I’m a huge fan of monte cristo sandwiches so I know I’d love this pizza version. What a great idea! Also a very firm believer that everything’s better on pizza, including a Monte Cristo. Can’t wait to try this!